It’s been a while…time flies when you are working hard. Just a few weeks ago we successfully launched Tonight app — the only event discovery app in the world that matches the events to your precise music taste. Forget about endless scrolling to see where to go this weekend. It seems that we like a good challenge so we picked one of the toughest markets to start — Slovenia. And to make it even more challenging we started the campaign in December and find a way to shine among all the biggest players on the market. But what happened after blew our minds. 2019 started out great — we partnered with the biggest electronic conference in the US — Winter Music Conference which is part of Ultra Miami. WMC is set to kick off on 25th to 28th Match and it will be filled with the most influential industry leaders alongside with some of the biggest stars such as Armin van Buuren, Laidback Luke, Nicole Moudaber and Richie Hawtin. 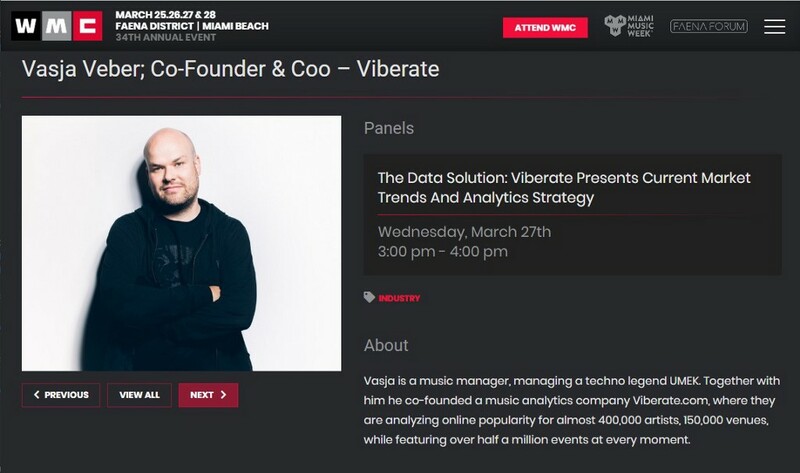 With Hundreds of thousands of people migrating down to South Beach for Ultra Miami and WMC, this will be amazing opportunity for Viberate to not only reveal all the predictions for the electronic music in an exclusive panel about Data Solutions, but also talk about the future of decentralized transactions with our advisor and Bitcoin Pioneer Charlie Shrem on the Crypto and Blockchain panel.